How did King Harold II die at the Battle of Hastings? The question is simple enough and the answer is apparently well known. Harold was killed by an arrow which struck him in the eye. 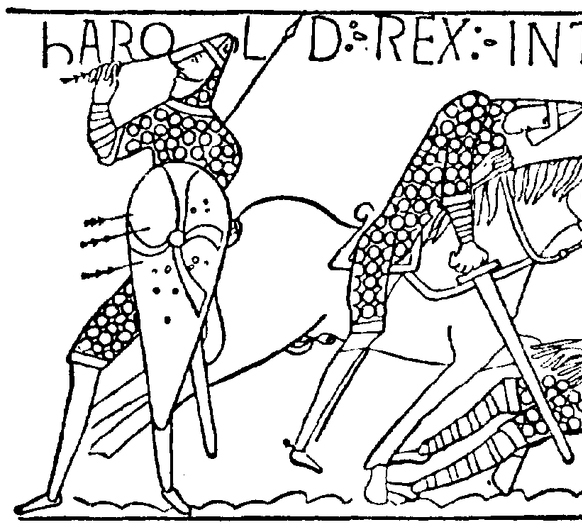 His death is depicted clearly on the Bayeux Tapestry in one of its most famous images: as the battle draws to a close, Harold stands underneath his name in the inscription ‘Hic Harold rex interfectus est', head tilted backwards, clutching a golden arrow which protrudes from his face. The scene is so celebrated that it has become one of the iconic images of British history and the ‘arrow in the eye' story, for many of us, is synonymous with 1066 and all that. And so it should be, since Harold's death at Hastings brought about the demise of Anglo-Saxon England and precipitated the greatest turning-point in the history of the British Isles.